A post for our times! Very funny, and very NOT-funny. Sorry to know that the current owner of the coffee table can’t tell the difference between “think” and “thick”….may be symptomatic? I thought the ad on Craigslist was just a joke until I googled it and found that bulletproof sofa. The problem with this table isn’t that it shows a level of paranoia that is clinical, it is that I have to get the price through email. Anyone deranged enough to buy this won’t want to give a stranger their email address. sure beats those shelters they wanted us to build during the nuclear cold war! We never had one of those shelters. Those required a large outlay of cash to build and stock. Please send pictures if you test your furniture. Damn! And we just replaced our sofa and coffee table in the room closest to all the points of entry! Sorry I didn’t post this sooner. The sort of family who’d be looking for a couch like that is obviously a special needs family, and I know that American are very tolerant of special needs. 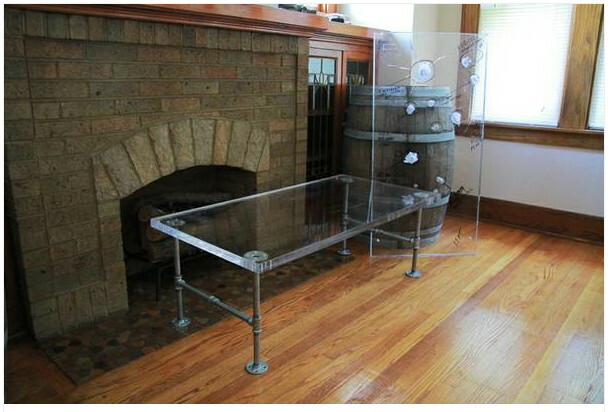 But the coffee table seems to hold a different sort of secret. Could be that someone who’d be worried about his glass eye falling out over the coffee table… Or maybe someone who has guests who pound the table every time they make a really cogent political comment… maybe it’s best we don’t try to understand every thick that’s going around these days. I imagine that the next thing we’re going to hear about is a coffee table that shoots back if attacked. There’s a balance between safety and paranoia. Since I live in a very safe area and neighborhood, I don’t face the possibility of violence on a daily basis. That’s the reason, I was intrigued by the ad – it’s local. I think it’s a trend though, and we’ll see more defensive furniture. I would have liked to respond to the ad just to find out if the person was serious or joking. But I’m a little to paranoid myself to do something like that. Although your garden variety slug is crafty and able to penetrate most vegetables, I have heard that it lacks the velocity to penetrate a bullet resistant coffee table. It’s those tactical slugs we must watch out for. If only they had “thought” to read the ad before they posted the “think” then we would not be having such fun at their expense. I sure hope that they have a “think” skin and are not too sensitive to a bit of humor.. What do you “thick” about it? You are a straight shooter and everythink you said was on target. PS. My current glass coffee table couldn’t stop a nurf slug without shattering.. I “thick” I may need an upgrade to military-modern. But, I do have Kevlar sheets and pillow cases on my bed for when I’m hiding under it, to escape the heavily armed boogie-man! Swords! Do you have a cape, too? If so, you must post pictures. Oh, WHY have I wasted my creative life making *art* instead of using my formidable design skills to invent Lifesaving Home Furnishings???? I feel like such a failure. Luckily, no one will be able to bump me off for my ineptitude when I crouch behind my newly-acquired bulletproof coffee table. Kathryn, you have the skills to create elegant lifesaving furniture. If you start taking orders, I would like an armored armoire.